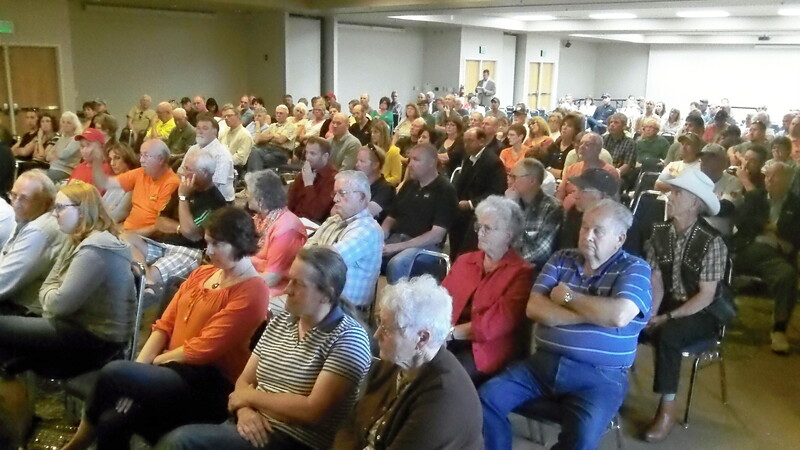 Part of the crowd at Tuesday’s hearing on the proposed Millersburg electric power takeover. If the Millersburg City Council goes ahead and expels Pacific Power in favor of its own municipal electric company, it will be over substantial opposition from the town’s residents. That was my impression after Tuesday night’s public hearing at the Linn County Fair & Expo Center. About 150 people showed up, by my estimate, maybe more, and from the audience reaction to those who spoke up, the prevailing mood on the power takeover seemed to range from skepticism to hostility. 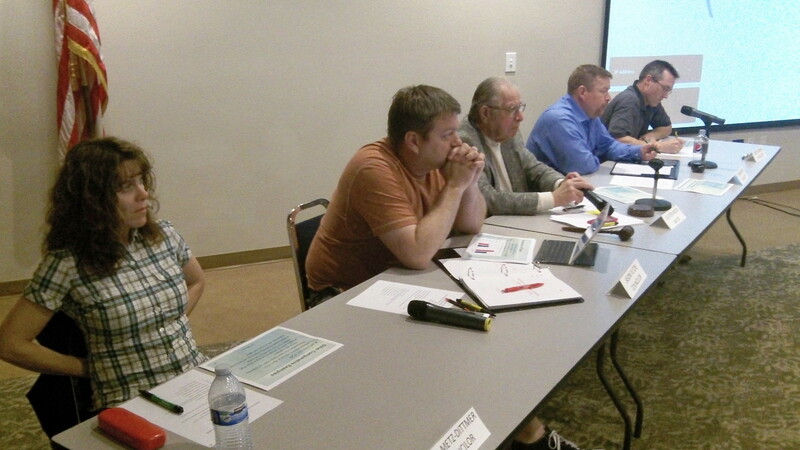 Council members Lisa Metz-Dittman, Jason Yutzie, Mayor Clayton Wood, Darrin Lane and Scott Cowan listen. The council heard again from consultant John Heberling of D. Hittle & Associates, whose feasibility study projected substantial savings for Millersburg power customers; and from Scott Bolton of Pacific Power, who said the study underestimated the takeover’s costs and thus overstated any savings to customers. Jim Denham of Wah Chang also spoke. Among his points: Having a municipal utility would help economic development in Millersburg. And rates would be set by the city council rather than regulated by the Public Utility Commission, which he said is appointed and not accountable to the public. Pacific has a new consultant’s report backing up its contention that the municipal takeover would be a bad deal for Millersburg. It estimates the acquisition and system-separations costs at more than $50 million rather than the $16.6 to $20.6 million estimated by Hittle. Ninety percent of Millersburg power consumption is used by four industrial customers, and 70 percent by Wah Chang alone. The town’s fewer than 800 residential customers account for just 3 percent of power use. This proportion among customers would make Millersburg the most unusual public utility around, and if one of the industries left, residents would be left to pick up the cost of paying off the acquisition costs. A woman from the audience suggested making Wah Chang buy a bond guaranteeing the company would pay off its share of the cost if it closed. Steve, this was a great idea. I think the top 4 industries (using 90% of all power) that were mentioned should all put up such a bond, not just Wah Chang. If any of the industries left the City….it could negatively effect residential utility rates. I repeat…”or the utility’s remaining customers.” It appears from everything that I have seen and read that the State PUC has our back ! Allow the Municipal Utility… allow an ever changing city council to make those decisions. Does it also not concern the Citizens that the Council will not comit to a vote on this issue by the public ? Thank you for all the resident’s/neighbors who came to the meeting last night and a thanks to Hasso for covering this important local story !